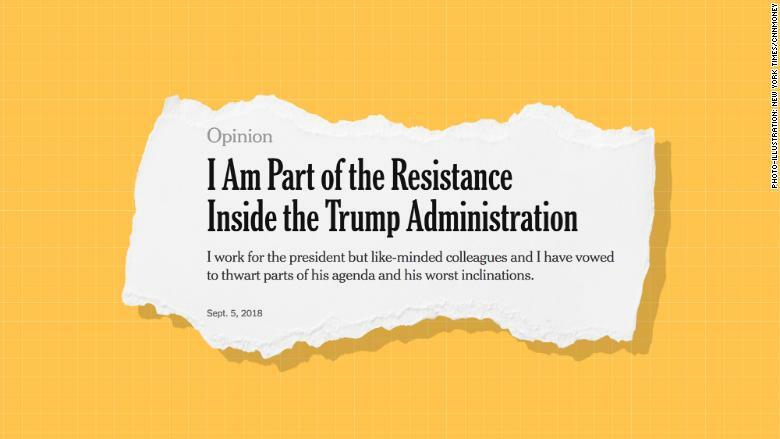 Who is the senior Trump administration official who wrote the anonymous op-ed in The New York Times this week about an internal "resistance" to President Donald Trump? Even the paper's executive editor, Dean Baquet, doesn't know. That is how closely guarded the Times is being about protecting the writer's anonymity. "That is the strength of the firewall" between the paper's news and editorial departments, Patrick Healy, the paper's politics editor, told CNN's Brian Stelter on "Reliable Sources" Sunday. No identifying information has leaked to the Times's newsroom, which sits on a separate floor from the editorial department in the paper's Manhattan office building, Healy said. Healy declined to say whether Times reporters are working to uncover the identity of the op-ed's author, as journalists at other major news outlets are clamoring to do. "We can't talk about the journalism that we're doing," Healy said. He said the agreement made between the author and the Times' editorial department does not apply to the the newsroom. "The decisions that the editorial department has made, from the vetting to the anonymity granted, and the news department are totally different," he said. Healy defended the editorial page's decision to publish the anonymous essay, a controversial and rare move by the paper. "The New York Times has one of the most strict, toughest, vetting processes for anonymous sources, whether it's our reporting, or knowing my colleagues on the op-ed side, on the editorial side, for any kind of anonymity that's granted," Healy said.